Payment Methods: Credit Card, Check or School Purchase Order. 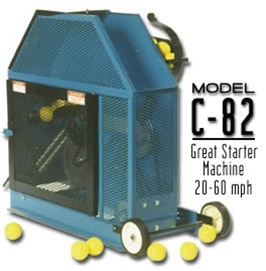 A COMPACT, INEXPENSIVE TRAINER FOR THE KIDS - A Great Starter Machine. Also Ideal for Slow-Pitch Softball! Not recommended for high school baseball or fast pitch softball. Dimensions: 36"Hx20"Wx36"L . Shipping Weight is 175 lbs.